@Cyber-Hand Of course, you can use that pics. I'm with @Payinku here. Seems like the bottom should be wider. What a coincidence that I brought up one of the exact things you're working on. Both look great. I've always been so fascinated by prototypes and preliminaries and the sort, so you bringing this mask to life is extra cool. Hey @Cyber-Hand I was going to PM you or something about this but I figure I might as well ask it here. Is it possible that you can do the Masks of Ultimate Power in Trans-Colors (Reds, Blues etc.)?? Reason I'm asking is just because I'm working on a MOC currently and I kind of thought a Trans-Blue MoUP would be pretty cool. 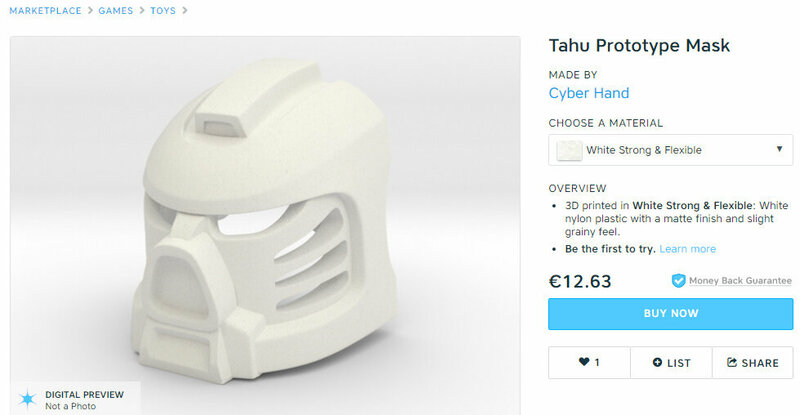 I don't know if that's a viable option for you (in terms of what Shapeways can do) or for me (in terms of how expensive that would be, if it is possible). But I figured it wouldn't hurt to ask. Thank you Cyber-Hand. I'll be getting a MoUP and a G2 Vahi once the MoUP tweaks happen. I don't want to be a pest, but are you still planning on updating the villager scale MoUP as well? Regardless of the wait, if my MoT is as good as I'm expecting, I would definitely be purchasing the former in gold steel as well for my collection. Hey @Cyber-Hand, what are your plans for the prototype Hau you're working on? Are you going to make that publicly available? I can't wait to get more of your masks! Okay, a transparent MoUP is indeed possible. Shapeways does have one transparent material but it only comes in clear. The resin ones I am going to make can be done to be in any colour you want. I just need to fine a transparent resin that is hard enough to use for the masks. I am using a resin with a shore hardness of 80D (construction hat hard) for non transparent masks and that should end up working very well for them. Yes, once the final model of the Titan scale is done. Just because it does take quite a bit of adjustment to scale it down, and I only want to do it once more. It will be available very soon. There have been a few things that I am having trouble with. (The side vents are very thin and my printer doesn't like it) But once I am sure it is good to print and the client has ordered theirs it will become available to the public. forgot to take pics for this. 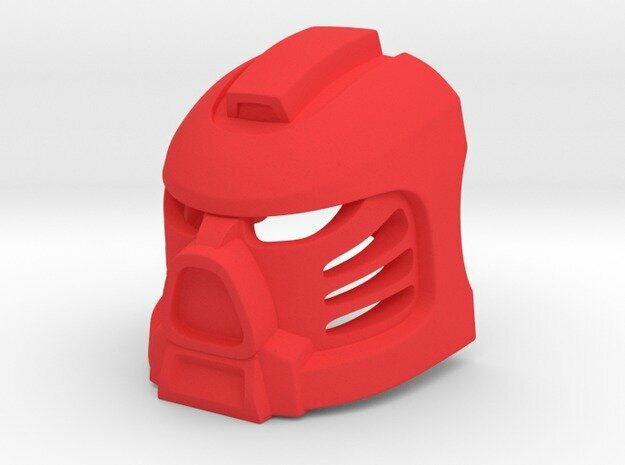 Okay everyone the Proto Mask of Fire is available one sahpeways now. Yo, Cyber-hand can you make the mask available in white strong and flexible polished? I want to get it but I fear the red color isn't going to match the standered CCBS red if I get it in red polished. 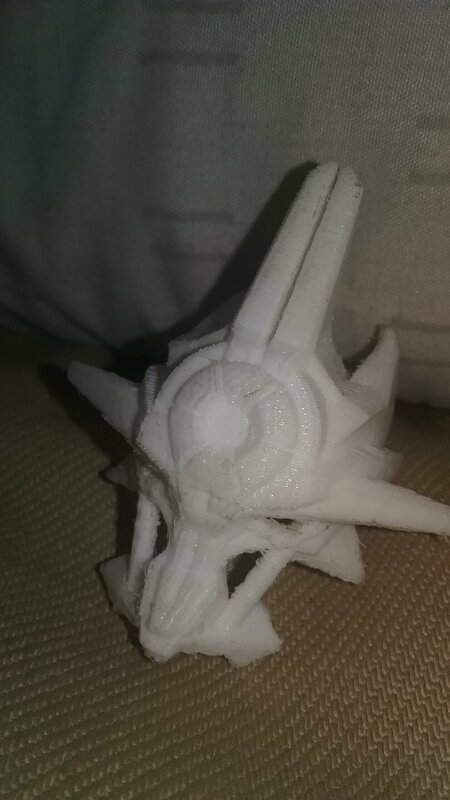 I would prefer if I could get it in the higher quality material but that it could be white so I can paint it my own red color. Currently this is the only thing holding me from getting the mask. I understand if you don't want to, thanks! Nope, that's white strong and flexible, not white strong and flexible polished. I'm ordering a copy right now. Looks like it's up fo white strong flexible polished, thanks Cyber-hand! If I start a YouTube channel, I'd like to use a life-size Noble Huna. Do you have any tips for making one? Ooh a chance to share some making tips. I would be happy to help. Firstly what sort of Budget are you looking at? Once you figure that out you can determine the best way to make your mask. The following methods are listed in order of cost and difficulty level. The cheapest option would be making one out of cardboard. It is a super easy material to get and you would be surprised at how versatile it is and you can make it look pretty good. But it isn't the best for longevity. Pepakura is a step up from using normal cardboard a very good way to make a mask out of cardboard. It takes a little longer but you have more control. You can also use fiberglass on the inside and bondo on the outside to make it very smooth much more resilient. That is the best method I can think of for someone working on a tight budget. I recommend 200GSM cardboard and a quick dry pva glue. Next stop in the craft making train is Yoga mats (aka EVA foam). Done in a Similar way to Pepakura, you print out a template on cardboard then cutting out the foam. Use a heat gun to shape the foam and quick dry cement to connect the pieces together. Now I have experience with all before mentioned methods. But now we get to my area of expertise. 3d printing Using a 3d model and 3d printer in order to make the parts. This is the method I used to make Eljay's current mask and you can see a bit more about how I did that here. Hope that helps, and If you have any more questions about each method feel free to ask. Could you post or send a link to some pictures of pepakura you've done? I'd really like to see. I don't have a 3D printer, but I know where I can use one. Do you mind making a 3D model of a Noble Huna, and maybe split it up into separate parts? That would be useful. Thanks. Is the MoUP currently on Shapeays the final version? Also, which is the best material to get in order to have the smoothest looking texture for the mask possible?